Canadian home sales jumped 4.1 per cent in June, the second consecutive monthly sales bump, and seemingly a sign that the market had finally recovered from the effects of January’s mortgage stress test. While many economists were quick to caution that the jump in activity might be a temporary one, it’s worth examining just how much the market changed last month, and why. For a closer look at these developments, Livabl has rounded up 6 charts that help put things in perspective. 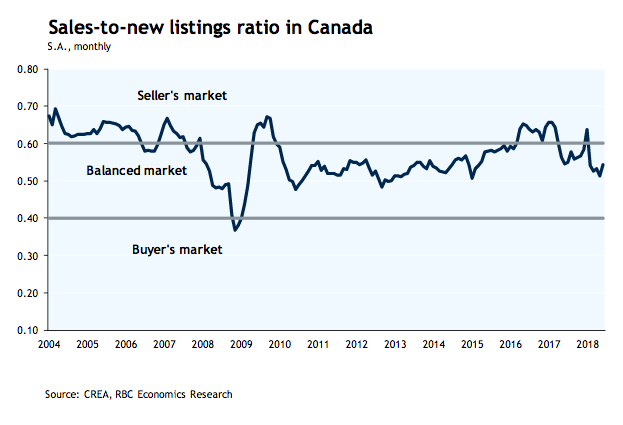 What’s going on here: RBC Economics used data from the Canadian Real Estate Association (CREA) to track Canada’s sales-to-new-listings ratio since 2014. A ratio of between 40 and 60 per cent is considered balanced, with readings above and below indicating seller’s and buyer’s markets, respectively. The takeaway: After plunging into balanced territory in January, the ratio started to inch upwards again in June, indicating that conditions are starting to tighten, as buyers return to the market. 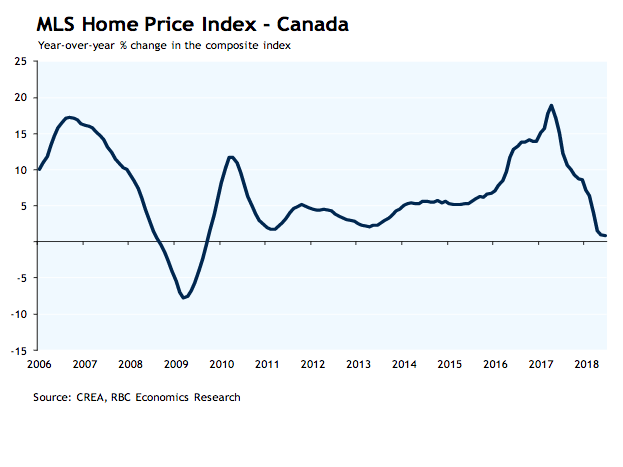 What’s going on here: RBC Economics used CREA data to track Canada’s MLS Home Price Index since 2006. The takeaway: Prices have been falling ever since the Liberal government’s Fair Housing Plan came into effect last spring in Ontario. However, last month saw the HPI start to flatten out for the first time in months, indicating that the market has begun to recover to the effects of government policy. 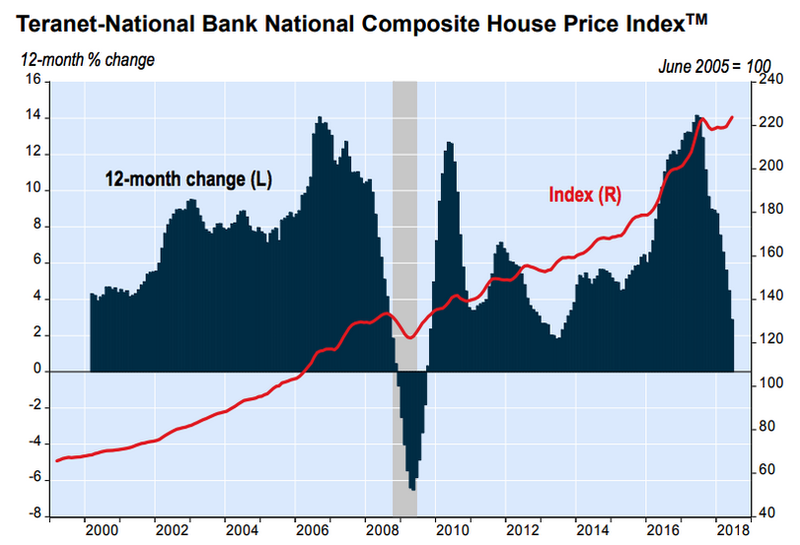 What’s going on here: The Teranet-National Bank National Composite House Price Index tracks the change in home prices across 11 Canadian markets. Here, it shows the index’s change since 2000. 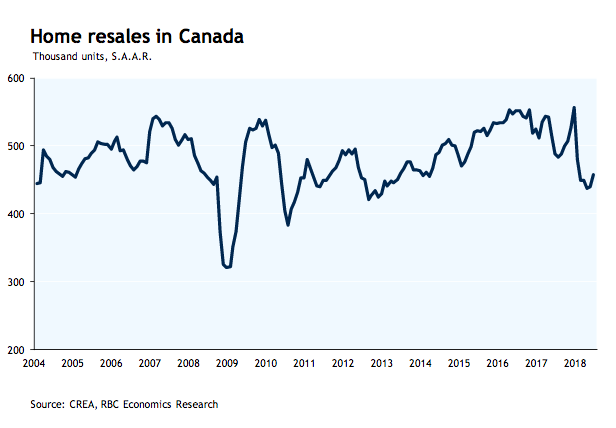 What’s going on here: RBC economics tracked home resales in Canada over the past 14 years. The takeaway: After the steep drop in sales in spring of 2017, we can also see a slight dip in January 2018, when the new mortgage stress test came into effect. In June, resales finally started to move upwards again. 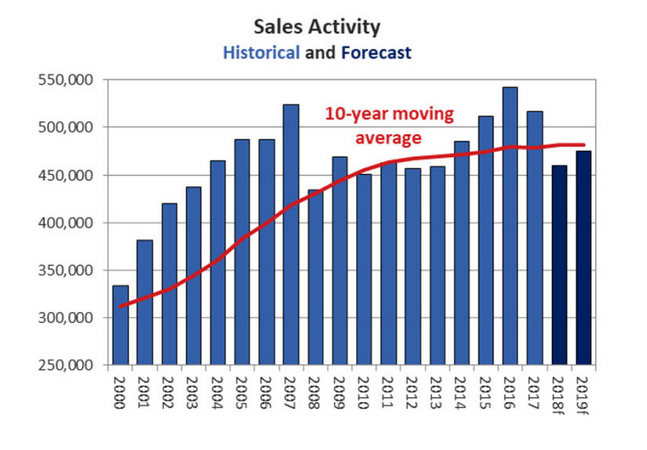 What’s going on here: CREA tracked Canadian home sales activity over the past 17 years, along with its predictions for 2018 and 2019, and compared it with the 10-year moving average. The takeaway: While sales in 2018 will likely remain below the 10-year average, they’ll start inching up towards it again in 2019, if CREA’s predictions prove to be accurate. What’s going on here: CREA tracked the number of newly listed homes over the past year. 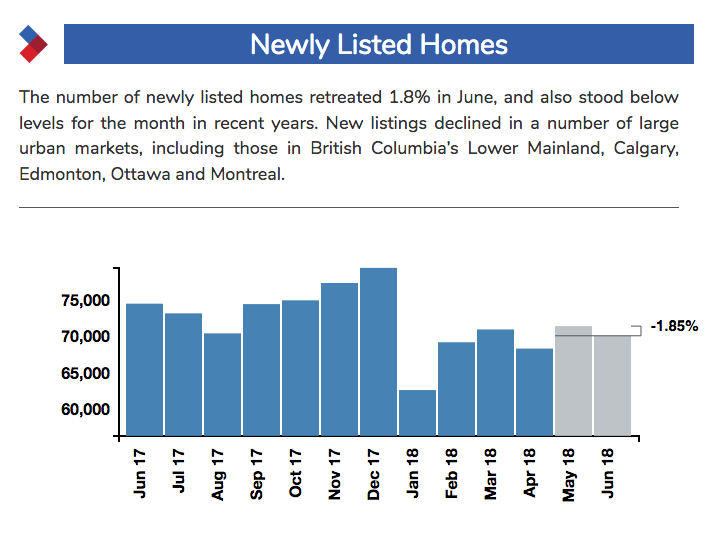 The takeaway: While listings were down 1.8 per cent month-over-month in June, they’re still well above where they were in January 2018, over even April of this year.